1. 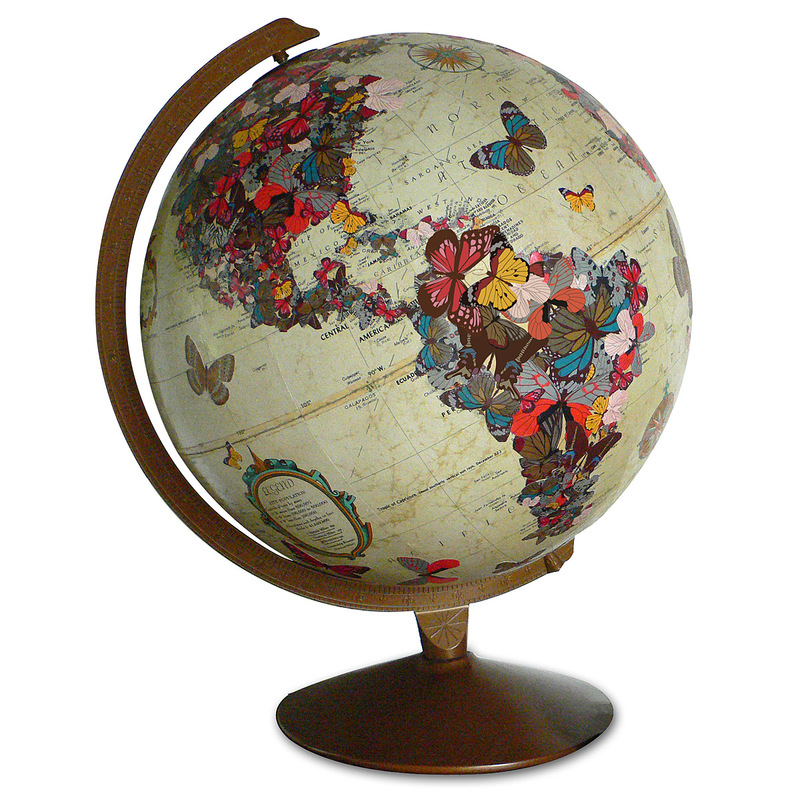 I am currently obsessed with: this globe, from Uncommon Goods. It's so lovely, and combines two of my favorite things-- antique academic ephemera, and butterflies. Unfortunately, it's also four hundred dollars. So I'm going to keep an eye out for vintage globes, because I bet I could make this. 2. Today I am ecstatic because: I thought a project I've been working on was due next week, but it's not due until the week after! I'm going to continue on schedule as though it was due next week, to leave room for any little changes, but it's going really well and I'm thrilled with how it's looking. It's probably the biggest project of this semester, so the fact that I'm not going to have to pull a single all-nighter is kind of incredible. 3. The age I am is 20 and the age I feel is usually 20. I think I'm in a growing-up phase, and it feels really good. This is a hard question to answer, actually, because I've never experienced being 20 from the perspective of anyone else. I feel better than I did this time last year, because I'm in a much more even mental state. Not nearly so many ups and downs. But I don't know if that necessarily means I feel older. 4. My favorite place is: .....oh wow. So many possibilities. I love being anywhere near the water, and I start to feel restless if I don't at least go walk by the river every few weeks, but I love being in the forest, too. Then again, I could spend days and days at the Metropolitan Museum of Art. And my weekends wouldn't be the same without trips to the West Village. 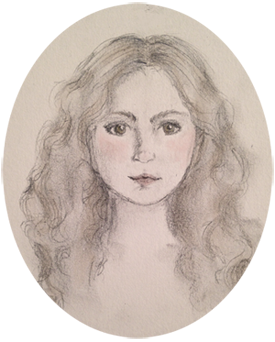 Cape May, New Jersey, is one of my favorite places, too, because it's lovely and Victorian and it's where I started feeling independent, going for walks by myself and waking up early in the morning to bring my sketchbook to the beach. 5. Something I have been procrastinating is: ....okay, I know this sounds unbelievable, but I'm not actually procrastinating about anything at the moment. I've come to terms with the fact that I absolutely can't function on less than six hours of sleep, so procrastinating is kind of out of the question. 6. The last thing I purchased was: a presentation board, marker paper, and a .08mm Micron pen, from Fashion Design Books. 7. The thing I love most about my home is: different depending on whether I'm at school or not. When I'm at school, my favorite thing about my room is how cozy it feels when I'm reading in bed with only my Christmas lights on, and the next morning, when the sun is streaming in, and my duvet looks all fluffy and soft. When I'm actually at home, my favorite thing is getting to be with my family, especially when we watch movies at night. The house always smells good because my parents cook a lot of delicious things, and in the summer it feels all fresh and breezy. ...Okay, and I love getting to cuddle my cat, now that she's decided she's the sort of cat who cuddles. In case you missed it earlier today, I posted about my friend Julianne and her fiancè, Jude, who are in a contest to win a honeymoon trip! Read about them here or just go vote for them! They're only 20 votes out of first place! Well, I haven't been there in a few years, so most of my favorite places in Cape May are the ones that appeal to a sixteen-year-old girl. But yeah! There's a store that has lots of Sanrio stuff, I was a big fan of that, and lots of bookstores. Atlantic Books was my favorite. And I remember going to a butterfly house when I was very young, but the details on that are a little fuzzy in my memory.